Bookman's Bookstore, with four locations across Arizona, is celebrating the beginning of National Banned Books Week (Sept. 30 - Oct. 6) with an incredible video featuring local customers and staff reading a single line from a banned or challenged book. 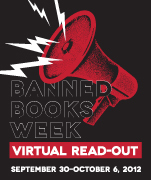 This year marks the 30th anniversary of Banned Books Week, being celebrated in part with the second annual Virtual Read-Out, wherein bookstores and readers are encouraged to create videos proclaiming the virtues of the freedom to read. Bookman's video was made in conjunction with the Virtual Read-Out project. Watch the video below and learn how to make your own contribution to Banned Books Week here!